We gather tonight to immerse ourselves in the mystery of God’s Love. This evening we begin the sacred Easter Tridium that remembers the passion, death and resurrection of Christ. Tonight, we give thanks for the gifts of the Eucharist, the priesthood, and the example of Jesus washing the feet of his disciples. Holy Thursday celebrates the Last Supper and Jesus’ service of love by washing his disciple’s feet. On that night on which Jesus was betrayed he gave of himself without reserve. At Supper, Jesus loving those who were his own even to the end offered his Body and Blood, under the appearance of bread and wine. This self-giving love was consummated by his Sacrifice on the Cross. In doing so, God revealed the extent of his love in being completely given-up for us who now share in his life. We share in Jesus’ love-offering through our communion with Jesus which, in turn, strengthens us to give of ourselves to others. 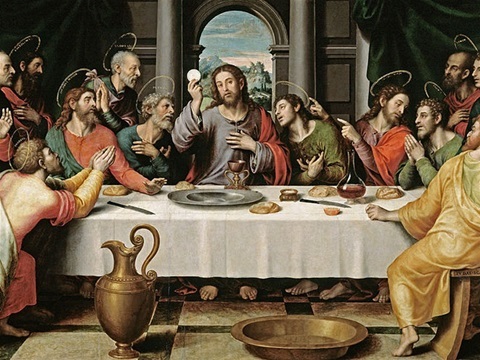 We also remember that, on the night of the Last Supper, after Jesus gave the Eucharist to his Apostles, he then he enjoined on them the priesthood. This means that the mystery of God’s love may be celebrated by his Church throughout time, perpetuating the Sacrifice Jesus made. Tonight, we give thanks for the institution of the Eucharist by which under sacramental signs, Jesus brought to perfection the sacrifice of the old Law and continues to make present his Sacrifice offered once and for all on the Cross. Hence, the New Law is fulfilled every time we celebrate the Sacrifice of the Mass and the washing of the feet is a visible sign of that Love.